Can you create a presentation using Microsoft® PowerPoint® or Apple® Keynote®? 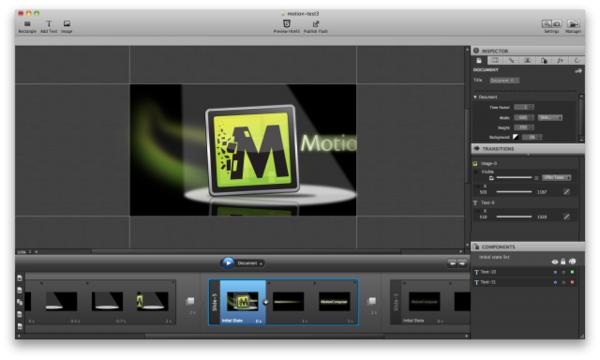 If so, then you also can create Flash® andHTML5 animations with MotionComposer. Unlike most tools MotionComposer does not use complicated concepts such as timelines. Instead you use tools you already know from standard presentation apps – slides, animations, transitions, and actions. For each “scene” in your animation you create a slide, select from an easy-to-use inspector palette how your content should be animated on each slide, and use a variety of actions to switch between scenes with smooth transitions.